Gujiya is a sweet fried dumpling which is filled with a mixture of milk solids (mawa/khoya) and nuts. 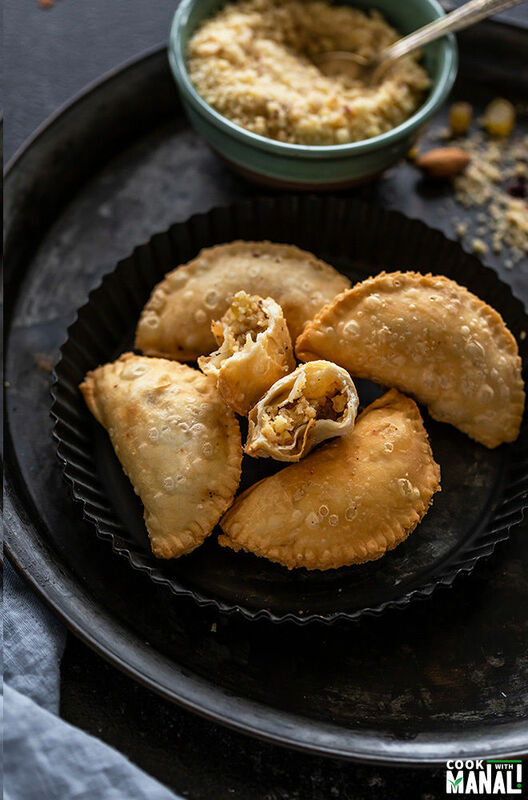 These mawa gujiya are the perfect festive treat, the addition of coconut makes them so special! 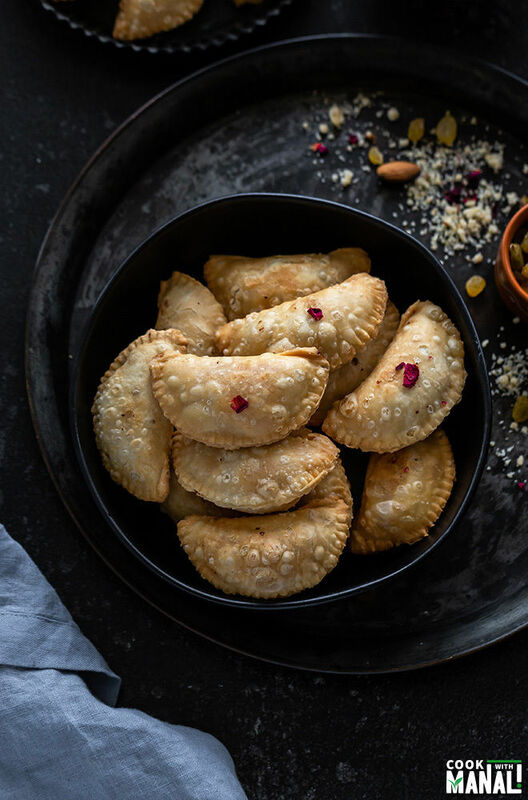 In North India, gujiya is typically made during the festival of colors, Holi which is only a few days away. 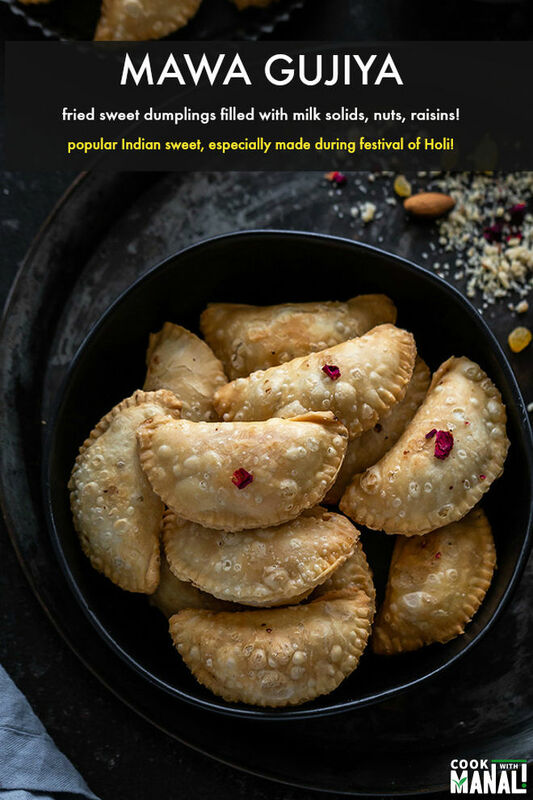 As a child, getting to eat gujiya was the only thing that made me excited about this festival. Throwing colors and water on everyone was never my cup of tea and Diwali was and will always be my favorite festival. But still Holi had its charm and the biggest one for me was getting to eat hot homemade gujiyas. Yummy! Every year few days before Holi, we would all sit down to make gujiyas. I always used to help mom in making this sweet, of course I didn’t know to knead the dough and all but I used to do the filling part. It used to be a lot of fun and today while making gujiyas I was terribly missing mom. What would I not give to make gujiyas with her again. But, now I only have these memories for the rest of my life. 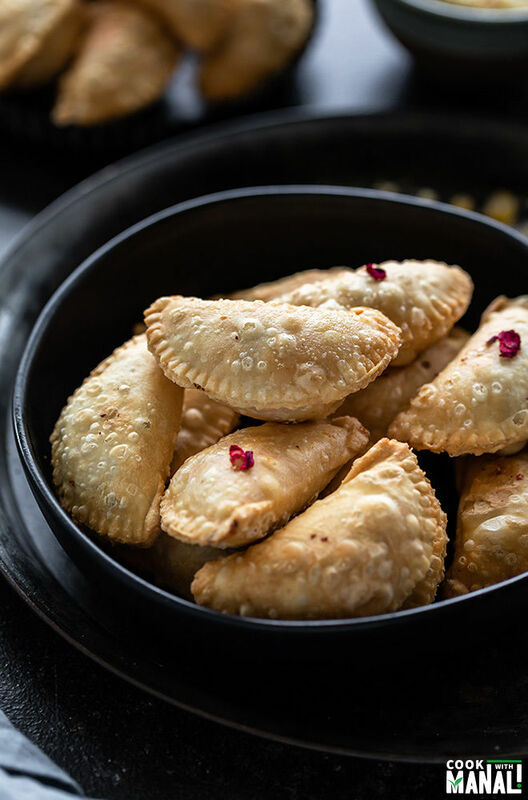 Gujiya is a sweet fried dumpling made from all purpose flour and filled with khoya/mawa, which is milk solids and nuts. It is known by different names like ghughra, karanji etc. across different states in India. The main filling for gujiya is mawa/khoya. We can make mawa at home but the process is tedious, you have to boil the milk and then keep stirring it at low flame till it thickens completely and all you are left with is dry thickened milk. In India, we do get mawa at stores but at my home we always used to make fresh mawa. I don’t have the patience for it honestly. 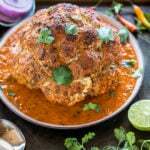 I have tried making it once at home and by the time the mawa was done, I promised myself to never make it at home again. Too labor intensive! I made these gujiya from frozen mawa that you get at Indian stores. It can obviously never taste as good as fresh mawa but hey it’s still gujiya and it’s still delicious! The dough for the gujiya is made like most other dumplings with flour, fat (ghee in this case) and water. Since it’s a dessert we do not eat any salt or spices to the dough. The main flavor of gujiya depends on it’s filling. 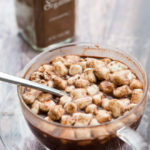 The main ingredients for the filling is mawa and nuts. My gujiys recipe also has some coconut. And the last part once it’s all assembled is to fry it. Always fry on medium-low heat else you will ruin your gujiya. People make gujiya in several ways. Some shape it by hand, some soak gujiya in a sugar syrup once fried, so it depends on the type of gujiya that is made at your home. My mom made simple gujiya, and there was no sugar syrup involved. So, I have kept the same here. 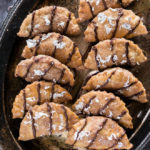 If you would like to dip your gujiya in sugar syrup, follow the instructions in this Chocolate Cinnamon Gujiya recipe. ✓ The key to making a good gujiya lies in frying it at the correct temperature. Always fry at medium heat. If you fry at high heat, the gujiya will be soggy and also uncooked from inside. You want it have a nice crispy crust and for that it has to be fried at low heat. Yes, it takes time so you will need to be patient here. ✓ Do not over knead your dough. Form a slightly stiff dough and let it rest for around 30 minutes before you roll it. ✓ Do not over fill your gujiyas. 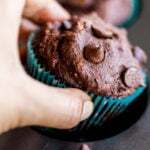 I have done that and it results in a disaster with the filling all around in oil. ✓ For the best taste, fry gujiya in a combination of ghee and oil. You can even use 100% ghee. 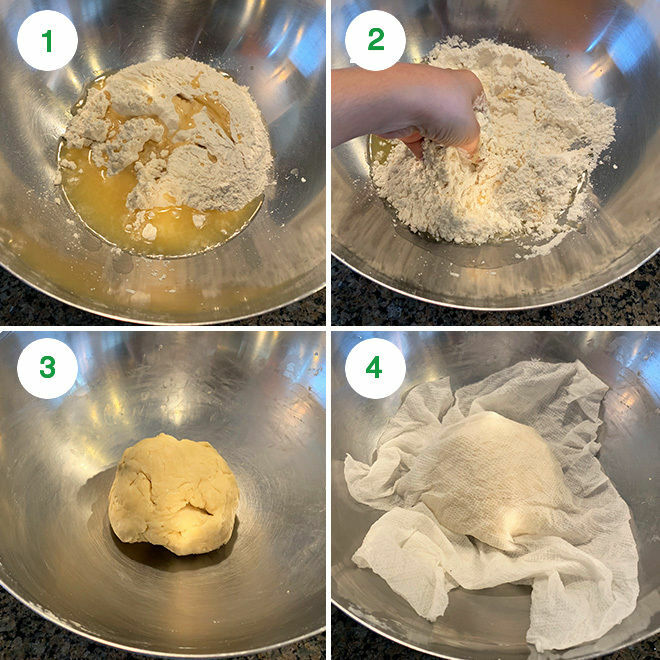 1- Take flour in a large bowl. Add melted ghee to flour. 2- Mix ghee with the flour using your fingers. 3- Start adding water little by little and knead to form a slightly stiff dough. 4- Cover the dough with a damp cloth and let it rest for 30 to 45 minutes. I cover with a damp paper towel (which I soak in water and then squeeze out all the water). 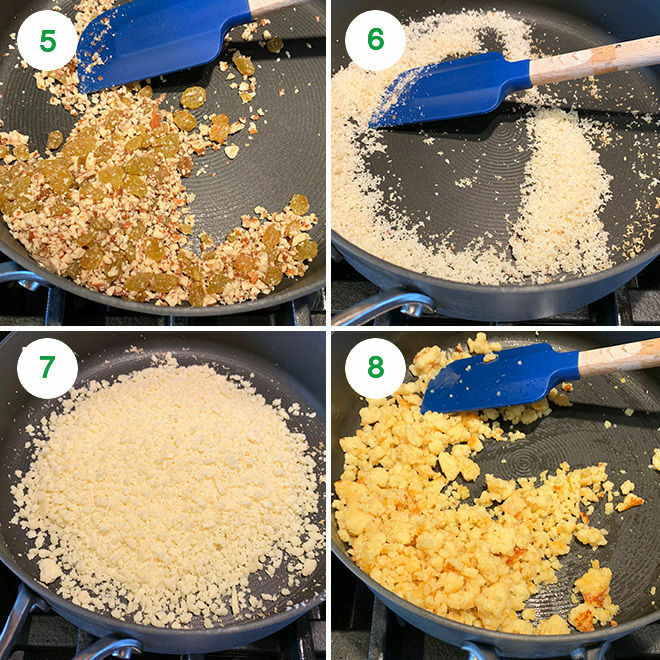 5- To make the filling, heat 1 tablespoon ghee in a pan on medium heat. Add chopped raisins and nuts and fry for 2 minutes until fragrant. 6- Then to the same pan add coconut and roast for 2 minutes until lightly fragrant. Transfer to a bowl. 7- Now to the same pan, add grated mawa. 8- Lower the heat to low and roast for 5 to 6 minutes until mawa turns light golden in color. 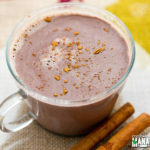 9- Transfer the roasted mawa to a blender, add 1 tablespoon of milk and blend so that it becomes smooth. You don’t need to add milk or do this step if using fresh mawa. The frozen mawa that I have used here is quite dry so I had to add little milk to it. 10- Transfer the mawa to a large bowl. Let it cool down a little. Then mix in the nuts, raisins, coconut powder, sugar and cardamom powder. 11- Filling is ready, it should be little moist and not completely dry. 12- Meanwhile mix 2 tablespoons flour with 3 tablespoons water in a small bowl. This mixture will be used to seal the gujiyas. 13- Divide dough into equal balls after it has rested. Keep it covered all the time as you roll each ball one by one. Each of my gujiya weighed around 30 grams. Meanwhile also heat oil or ghee in a kadai on medium-low heat to fry the gujiyas. I use a mix of oil and ghee. Roll each ball into a small circle of 5 to 6 inch diameter. 14- Place it on top of the gujiya mold. Apply the flour-water paste all around. 16- Press the two ends together to seal the gujiya mold. Remove the excess dough from the sides. 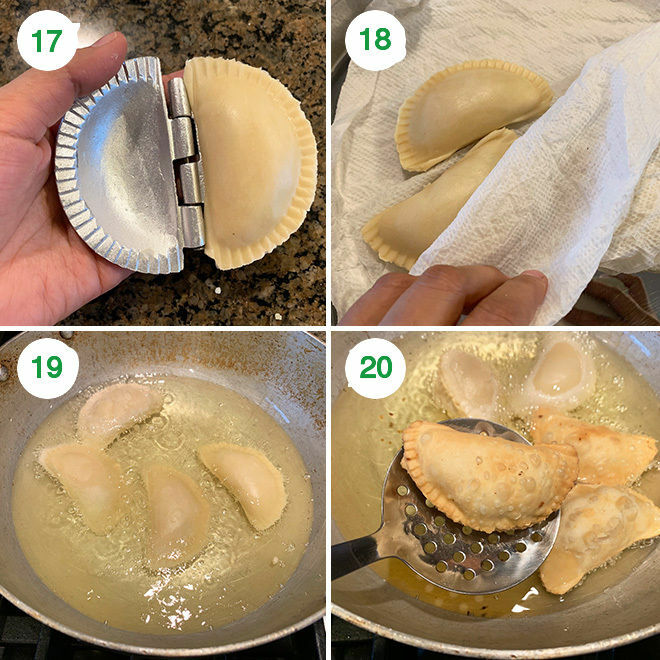 17- Make all gujiyas in the similar way. Keep the excess removed dough in one place and use it to make more gujiyas later. 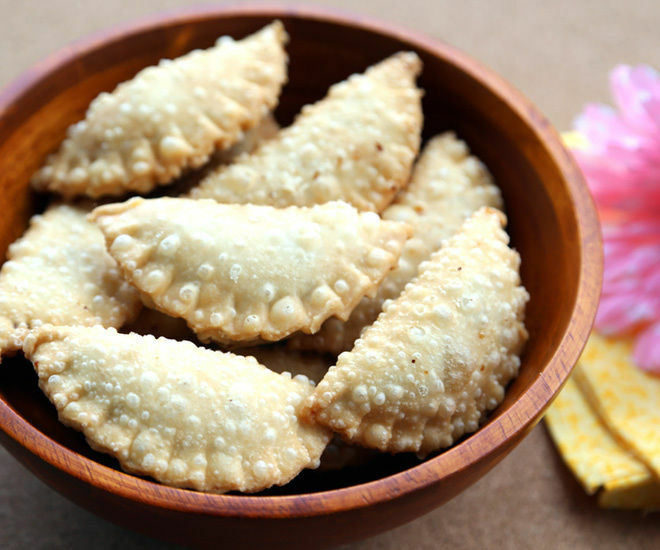 18- Keep all gujiyas covered all time with a damp cloth/paper towel so that they don’t dry out before frying. 19 & 20 – Once the gujiyas are filled and oil is hot enough, fry them on medium-low heat until light golden brown in color. First batch will take time, around 10-12 minutes. be patient, only fry on low heat. Next batches will fry in 6-7 minutes as the oil gets little hotter. But resist the temptation to fry at high heat. Fry all gujiya similarly. Serve immediately, I love them warm! Or store in an airtight container once cooled. I have not dipped gujiya into any sugar syrup. If you want, you can make a 1 string consistency sugar syrup and do it. 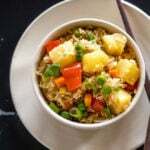 If you’ve tried this Gujiya Recipe then don’t forget to rate the recipe! 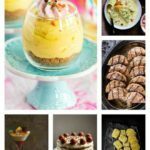 You can also follow me on Facebook and Instagram to see what’s latest in my kitchen! Fried sweet dumplings filled with thickened milk (mawa), nuts, coconut & raisins. 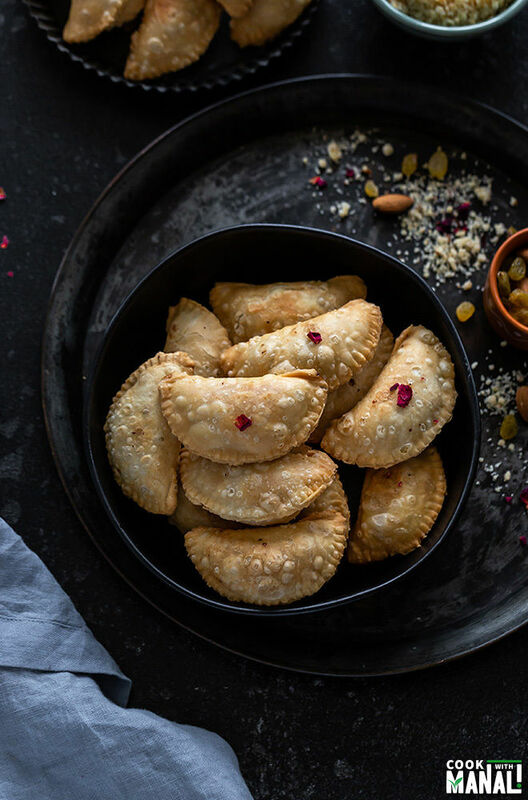 Gujiya is traditionally made in Northern India during the festival of colors, Holi! Take flour in a large bowl. Add melted ghee to flour. 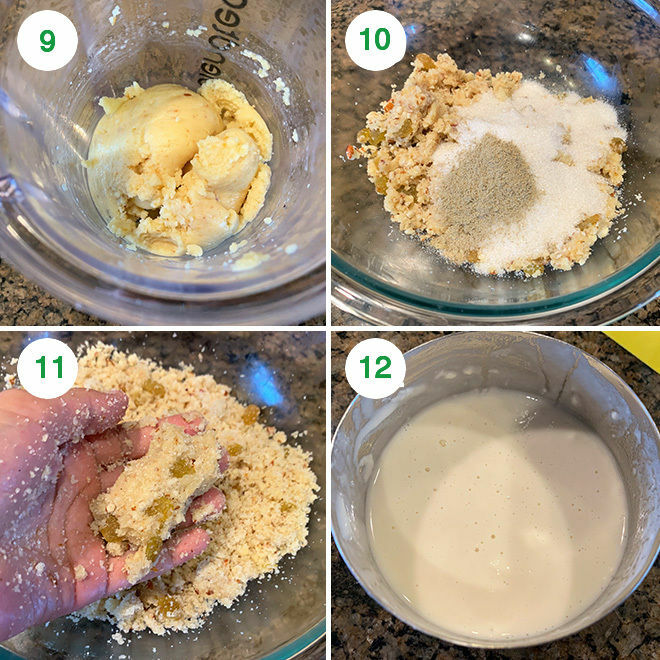 Mix ghee with the flour using your fingers. Start adding water little by little and knead to form a slightly stiff dough. Cover the dough with a damp cloth and let it rest for 30 to 45 minutes. I cover with a damp paper towel (which I soak in water and then squeeze out all the water). To make the filling, heat 1 tablespoon ghee in a pan on medium heat. Add chopped raisins and nuts and fry for 2 minutes until fragrant. Then to the same pan add coconut and roast for 2 minutes until lightly fragrant. Transfer to a bowl. Now to the same pan, add grated mawa. Lower the heat to low and roast for 5 to 6 minutes until mawa turns light golden in color. Transfer the roasted mawa to a blender, add 1 tablespoon of milk and blend so that it becomes smooth. 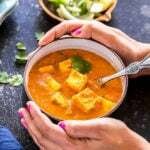 You don't need to add milk or do this step if using fresh mawa. The frozen mawa that I have used here is quite dry so I had to add little milk to it. Transfer the mawa to a large bowl. Let it cool down a little. Then mix in the nuts, raisins, coconut powder, sugar and cardamom powder. Filling is ready, it should be little moist and not completely dry. Meanwhile mix 2 tablespoons flour with 3 tablespoons water in a small bowl. This mixture will be used to seal the gujiyas. Divide dough into equal balls after it has rested. Keep it covered all the time as you roll each ball one by one. Each of my gujiya weighed around 30 grams. Place it on top of the gujiya mold. Apply the flour-water paste all around. Press the two ends together to seal the gujiya mold. Remove the excess dough from the sides. 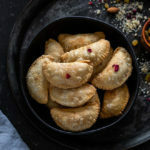 Make all gujiyas in the similar way. Keep the excess removed dough in one place and use it to make more gujiyas later. Keep all gujiyas covered all time with a damp cloth/paper towel so that they don't dry out before frying. Once the gujiyas are filled and oil is hot enough, fry them on medium-low heat until light golden brown in color. First batch will take time, around 10-12 minutes. be patient, only fry on low heat. Use a mix of oil and ghee to fry the gujiyas. You can also use 100% ghee. You can coat these gujiyas in sugar syrup if you want. Make a one string consistency sugar syrup and then add the fried gujiyas to the syrup until coated. I made homemade mawa its brown and consistency is like peda sweet. What should i do to make it little dry to make filling. And if its not dry will my gujia be ok if i dont put in fridge. Because wet khoya may rot after a time right. 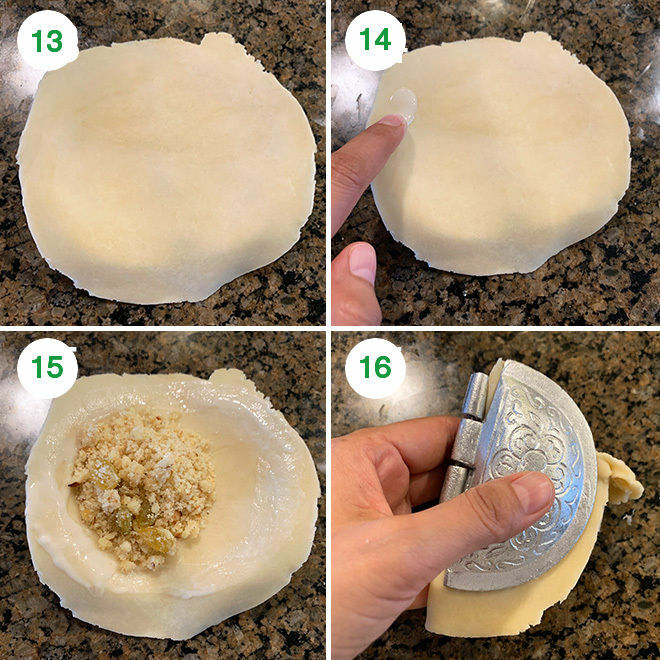 you gujiya will be okay..the filling should be little moist anyway…if it’s very wet and then I would suggest putting it in a pan and roast on low heat until it dried out a little..hope this helps…and gujiya stays okay in an airtight container for a week….